The continuing growth in government spending, taxing and regulation of economic affairs in the United States and in many other parts of the world has raised anew the essential issue of political control and intervention in the market place. With June 5th marking the 291st birthday of the famous Scottish economist, Adam Smith, it is, perhaps, worthwhile to recall his insights on the superiority of the free market in place of the heavy hand of government. Adam Smith was born on June 5, 1723 in the small village of Kirkcaldy, Scotland. His mother raised him following his father’s death when the baby was only two months old. Smith was almost fated for a different future when at the age of four he was kidnapped by a band of roving gypsies. Fortunately for mankind a posse was formed and he was rescued from a possible life of tarot card reading and pickpocketing. He was notoriously absent-minded. He once fell into a pit by the side of the road while deep in conversation with a friend. On another occasion he made himself a drink of bread and butter and declared that it was the worst tea he had ever brewed. “The Wealth of Nations” was published in March 1776, just a few months before the signing of the American Declaration of Independence in July of 1776. If the American Founding Fathers articulated in their Declaration the political case for individual freedom, Adam Smith presented the complementary argument for economic freedom and free enterprise. Every individual, as long as he did not violate the “laws of justice” – a respect for every other person’s right to their life, liberty and honestly acquired property – would then be “left perfectly free to pursue his own interest his own way, and to bring his industry and capital into competition with those of any other man” or group of men. And, third, the provision of a small handful of “public works” such as roads, bridges, the dredging of harbors, and the like. Except for a few other limited and narrow activities, in Adam Smith’s view all other matters should be left up to the choices and decisions of individuals, either on their own or in voluntary association with others in society. Smith’s system of natural liberty, therefore, came very close to the free market ideal of laissez-faire. He was fearful of extending government’s control much beyond these narrow duties because political power easily was used and abused by the type of person that he called, “the man of system.” This is the individual who today we would refer to as the “social engineer” or the “paternalistic planner” who presumes to know better how men should live than those people, themselves. The social engineer views the members of society as mere pawns on a “great chess board of society,” to be moved about with little thought or consideration that each of those “pawns” is a living, thinking, valuing and planning individual, who would much prefer to make his own decisions concerning how he will live and act. “The man of system, on the contrary, is apt to be very wise in his own conceit, and is often so enamored with the supposed beauty of his own ideal plan of government that he cannot suffer the smallest deviation from any part of it. But if governments and social engineers are not to plan and direct how and where people will go about the economic affairs of everyday life, how can it be assured that the goods and services that people both need and want for their survival and desires will be produced and supplied to meet their demands? Adam Smith was insistent that the economic relationships in society need no guiding and commanding hand from government. They arise quite naturally and spontaneously among people, without political orders or directives. “It is the maxim of every prudent master of a family, never to attempt to make at home what it will cost him more to make than to buy. The tailor does not attempt to make his own shoes, but buys them of the shoemaker. The shoemaker does not attempt to make his own clothes, but employs a tailor. The farmer attempts to make neither the one nor the other, but employs those different artificers. “All of them find it for their interest to employ their whole industry in a way in which they have some advantage over their neighbors, and to purchase with a part of its produce, or what is the same thing, with the price of a part of it, whatever else they have occasion for. This division of labor creates an inescapable network of human interdependency in which each person specializes in producing one or a small handful of goods, and uses it as his means of payment to purchase from others in society all the other things that he wants, but which they are better at supplying than himself. If this network of division of labor exists and operates within a “system of natural liberty,” each man will soon find that it is in his own self-interest to apply his own activities in ways that serve and improve the conditions of his fellow human beings as the surest means of attaining his own desired goals and ends. Precisely because the “system of natural liberty” excludes violence, theft, or fraud, the only way any individual can acquire from others what he desires is by applying his own knowledge, abilities, and resources in a manner that enables him to produce and offer to others what they desire, so they will give in trade what that first individual wants to obtain. Thus, though it is no part of their motivating intention to improve the conditions of life of others, in their own self-interest each individual must devote his efforts to serving the wants of those others as a means to achieving his own ends. And, thus, while it is no part of the individual’s intention, the cumulative effect for society, Adam Smith argued, was that those goods most valued by others in society were the ones produced and offered on the market. These outcomes were far superior to any attempt by those in political power to consciously and purposely try to guide production into various directions. Those in political authority possess neither the knowledge nor wisdom nor ability to do so better than each man in his own corner of society, who is most familiar with the surrounding circumstances and opportunities. “As every individual, therefore, endeavors as much as he can both to employ capital in support of domestic industry, and so to direct that industry that its produce may be of the greatest value; every individual necessarily labors to render the annual revenue of the society as great as he can. Not only was this general betterment in the human condition the unintended result of each individual following his own self-interest in the market arena of voluntary and competitive exchange, Adam Smith considered it far superior to any attempt by government and those in political power to design and impose an order and coordination in the actions of the members of society. “By pursuing his own interest [the individual] frequently promotes that of the society more effectually than when he really intends to promote it. I have never known much good done by those who affected to trade for the public good . . .
“What is the specie of domestic industry which his capital can employ, and of which the produce is likely to be of the greatest value, every individual, it is evident, can, in his own situation, judge much better than any statesman or lawgiver can do for him. It is not that Adam Smith believed that people always knew enough to never make a mistake, or that their speculative judgments about an uncertain future would always be correct so disappoints or losses would never be suffered. He reasoned that each man, in his own corner of society, has a better understanding of his own circumstances and opportunities in the context of his own wants, desires and goals. And that each individual has the strongest motive and incentive to try to make his decisions wisely since failures experienced fell upon him. He who bears the costs and reaps the potential benefits has the greatest incentive to minimize the former and maximize the latter. The same does not apply, Smith argued, when those in political power make the decisions. The “statesman” in a faraway capital can never know and understand things the way each individual can evaluate and judge them in their own unique surroundings. No legislator bears the cost of the wrong decisions he imposes on others; after all, he continues to live off compulsory taxes collected from those upon whom he has imposed harm. 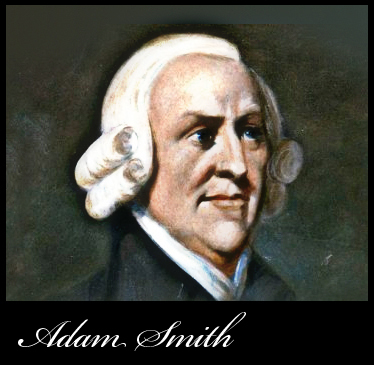 Adam Smith believed that international trade should be left to the free market as much as domestic economic activity. Each individual tries to minimize the costs that must be incurred in achieving his goals and ends. He only makes at home what is less expensive to make than to buy from others. And he buys desired goods from others only when those others can provide them at a lower cost in resources and labor and time, than if the individual attempted to produce that good through his own self-sufficient efforts. Thus, goods are purchased from producers in other countries only when they can offer them at a lower cost than manufacturing them in one’s own country. And, in turn, one purchases those foreign produced goods by supplying the foreign seller with some good or service at a lower cost than if he tried to produce it in his own country. When governments, through regulations and controls, force a product to be produced at home that could be less expensively purchased from abroad, it is misdirecting scarce resources and labor into wasteful and inefficient uses. The result must be that the wealth of that nation – and the material wellbeing of its citizens — is reduced by the amount by which more resources and labor must be devoted to making wanted goods than could be obtained through a free system of international division of labor and peaceful, mutually beneficial exchange. Hence, it is more prudent for the prosperity of one’s own nation to leave production and trade to the self-interested actions of the citizenry. Finally, Adam Smith argued that the benefits from free and competitive commerce and trade were not only the material improvements in man’s condition. It also served as a method for civilizing men, if by civilization is meant, at least partly, courtesy, and respect for others, and an allegiance to honesty and fulfillment of promises. When men deal with each other on a daily and regular basis, they soon learn that their own wellbeing requires of them sensitivity for those with whom they trade. Losing the confidence or the trust of one’s trading partners can result in social and economic injury to oneself. The self-interest that guides a man to demonstrate courtesy and thoughtfulness for his customers, under the fear of losing their business to some rival with superior manners or etiquette to his own, tends over time to be internalized as habituated “proper behavior” to others in general and in most circumstances. And through this social process, the other-orientedness that voluntary exchange requires of each individual in his own self-interest if he is to attain his own personal ends, fosters the institutionalization of interpersonal conduct that is usually considered essential to a well-mannered society and cultured civilization. “Whenever commerce is introduced into any country, probity and punctuality always accompany it . . .
“It is far more reducible to self-interest, that general principle which regulates the actions of every man, and which leads men to act in a certain manner from views of advantage, and is as deeply implanted in an Englishman as a Dutchman. “A dealer is afraid of losing his character, and is scrupulous in observing every engagement. When a person makes perhaps 20 contracts in a day, he cannot gain so much by endeavoring to impose on his neighbors, as the very appearance of a cheat would make him lose. “When people seldom deal with one another, we find that they are somewhat disposed to cheat, because they can gain more by a smart trick than they can lose by the injury that it does to their character . . .
“Wherever dealing are frequent, a man does not expect to gain so much by any one contract as by probity and punctuality in the whole, and a prudent dealer, who is sensible of his real interest, would rather choose to lose what he has a right to than give any ground for suspicion . . .
First, what he called “the prejudices of the public,” by which he meant the often-difficult task of getting ordinary citizens to see and understand the beneficial workings of and the logic behind a free competitive market. And, second, what he referred to as the “power of the interests,” that is, those special interest groups that lobby and pressure government to provide them with anti-competitive regulations and restrictions, protections for foreign rivals, and subsidies and tax-funded redistributions to the harm of and the cost to consumers, taxpayers, and potential competitors locked out of the marketplace. Indeed, when Adam Smith died in 1790 at the age of 67, it seemed highly unlikely that his idea and ideal of individual freedom and economic liberty would ever triumph. He believed it was utopian to ever expect the achievement of a regime of freedom of trade and enterprise. Yet, in the equivalent of one lifetime after his death, by the middle of the nineteenth century, freedom of enterprise prevailed not only in the United States, but had been established in his own country of Great Britain, and soon was spreading in varying degrees to other parts of Europe and then other areas of the world. The threats to economic freedom today are no greater than during Adam Smith’s own time about 250 years ago. And the same “prejudices of the public” and “power of the interests” stand in the way. In spite of Adam Smith’s own pessimism, his arguments and their eventual triumph for a good part of the nineteenth and early twentieth centuries demonstrates the power of ideas. If we take to heart and apply the logic of Adam Smith’s own explanation of the workings of a free market system to our own times, we, too, can triumph and establish a even better and more consistent “system of natural liberty” for ourselves and for the world that we will leave to our children and grandchildren.